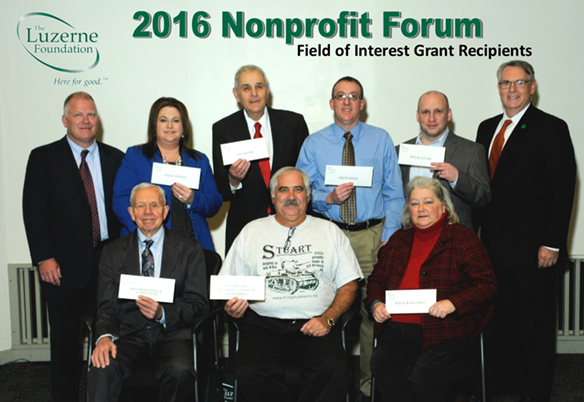 The Luzerne Foundation held its 3rd Annual Nonprofit Forum on Wednesday, March 30th. With over 100 people in attendance, 33 local nonprofit organizations spoke, for five minutes each, to share their mission, discuss the needs and challenges they face, and highlight their programming efforts. These nonprofit organizations represent the seven major field-of-interest areas that The Foundation feels represent our comprehensive community needs: Education and Scholarships, Neighborhoods and Community Development, Youth Issues, Historic Preservations and the Environment, Arts and Culture, Health and Wellness, and Social Services. Together, these seven fields of interest support a healthy and sustainable community that enhances the lives of Luzerne County residents. The Luzerne Foundation supports donors with their charitable giving, helping them invest strategically in causes they care about and in ways that make a difference in our community. We are a philanthropic leader, a community resource and a financial steward. We are… Here for Good. Additional grants will be announced and awarded at the Luzerne Foundation’s 2016 Annual Meeting on May 12th at the F.M. Kirby Center in Downtown Wilkes-Barre. Contact us to register!